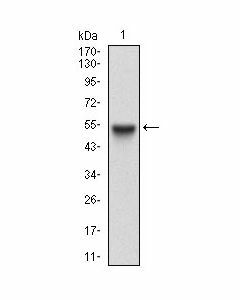 CPLX1 Human Recombinant produced in E.Coli is a single, non-glycosylated polypeptide chain containing 154 amino acids (1-134) and having a total molecular mass of 17.1kDa which includes a 20 amino acids His-Tag fused at N-terminus. CPLX-1, CPXI, CPX-I, CPX1, CPX-1, Synaphin2, Synaphin-2, Complexin-1, Complexin I, CPX I, CPLX1. The CPLX1protein solution contains 20mM Tris-HCl pH-8 and 10% glycerol. Greater than 90% by SDS-PAGE. MGSSHHHHHH SSGLVPRGSH MEFVMKQALG GATKDMGKML GGDEEKDPDA AKKEEERQEA LRQAEEERKA KYAKMEAERE AVRQGIRDKYGIKKKEEREA EAQAAMEANS EGSLTRPKKA IPPGCGDEVE EEDESILDTV IKYLPGPLQD MLKK.